"Jacques Maritain and Leo XIII on the Problem of Church-State Relations"
Jacques Maritain wrote in Man and the State (1951) that the “complete differentiation and full autonomy” of the temporal sphere found in the modern, secular age fulfilled the “very distinction between God’s and Caesar’s domains” found in the Gospel. Thomas Pink has argued that such a view is incompatible with what he calls the “Leonine model” of soul-body union articulated by Pope Leo XIII in Immortale Dei (1885). Pink’s claim that Maritain opposed Leonine teaching on Church-state relations, however, does not succeed for two reasons. Firstly, his conclusion overlooks critical qualifications in Man and the State that saves Maritain’s theory from advancing a strict separationist view of Church-state relations. Secondly, Pink ignores one of Maritain’s early works, Things that are not Caesar’s (1931), which reveals his full support of Leonine teaching in the tradition of St. Thomas Aquinas and St. Robert Bellarmine. Nevertheless, Pink’s critique of Maritain occasions important reflections on the relationship between principles and practicalities in the debates over Church and state. While Maritain’s view does not contradict what he and Leo XIII considered to be the immutable principles of Church-state relations, it remains to be seen whether Maritain’s practically attainable ideal is still, in fact, practically attainable. I’m especially grateful to Janice Chik Breidenbach, Bill McCormick, Michael Pakaluk, Tom Pink, and the volume editor, Heidi Giebel. 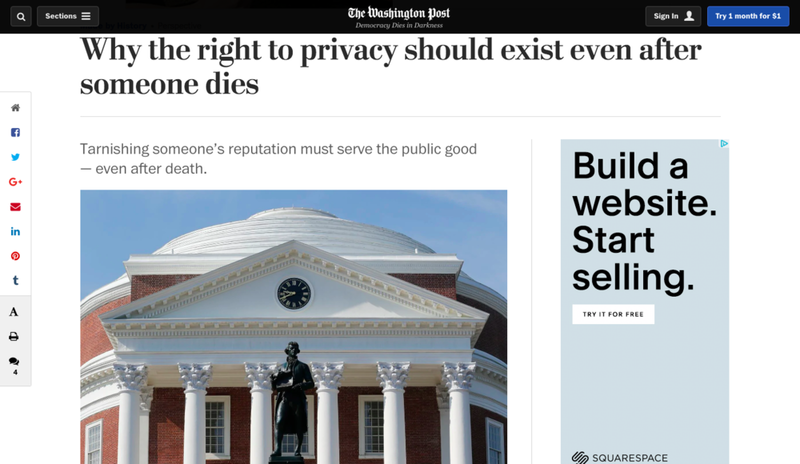 Washington Post: "Why the Right to Privacy Should Exist Even After Someone Dies"
In my Washington Post article, I take on the question of privacy for the dead. Is history is simply gossip about dead people? As social media sites amass the single greatest trove of human thoughts, feelings and activities ever recorded, historians will need to revisit how, or even whether, to disclose the private information of the dead, especially when those details are damaging to their reputation. Privacy matters, I argue, even after death. Disclosing the private lives of others, especially when divulging their faults, demands a legitimate reason: to understand a historical event or phenomenon, or even to serve as moral edification for readers, particularly in the case of public figures. Historians should interpret figures from the past, even those with mortal failings, with as much justice and charity as we ought to extend to the living. I also suggest that social media networks consider offering users the option of a “living will” in which their intentions may be known, either to delete or memorialize their account upon death. That feature may help users realize that while their posts might seem ephemeral, they may extend beyond their earthly lives (like this one). I thank especially the Made by History editorial team, Niki Hemmer, Kathryn Brownell, and Brian Rosenwald, as well as my colleague Paul Baxa. The Atlantic: "Raising the American Flag Made in China"
This Independence Day, The Atlantic published my essay on the politics of patriotism and globalization. I tell the story of how American flags made in China reveal American anxieties about economic globalization, while reactions among flag manufacturers in China show conflicting commitments to free trade and economic nationalism. Through interviews on both sides of the Pacific, including Chinese and U.S. flag manufacturers and a Member of Congress who sought to ban all foreign-made American flags, the essay shows the complexities of patriotism and nationalism as both countries now enter a trade war. The essay, part of the Object Lessons series, is available here. A special thanks to my editor, Ian Bogost. First Things: "What Would Have Stopped Martin Luther"
First Things published my essay, "What Would Have Stopped Martin Luther." It challenges the inevitability of the Protestant Reformation and argues that the Reformation could have been prevented if the pope had called an ecumenical council right away to judge Luther's theological disputes. I then suggest that this conciliar tradition presents an alternative for Protestants such as Stanley Hauerwas seeking to reform the Church from the outside. The article ends by suggesting that a new council might be needed to resolve the current doctrinal controversies in the Church. Next month, my wife and I will be lecturing on art history and the philosophy of beauty. This event will feature some of the highlights of the honors course we have been co-teaching this semester, which has included paintings, music, architecture, and film. If you are in the Miami area, you are very welcome to join us. Last September, Prof. Daniel Mark (Villanova) reviewed my William and Mary Quarterly article, "Conciliarism and the American Founding." In an Arc of the Universe post, he posed two questions: "First, can good Catholics be conciliarists? Second, were American Catholics conciliarists in good faith (as it were), or did they adopt conciliarism out of convenience?" Mark and the blog's founder, Prof. Dan Philpott (Notre Dame), invited me to respond. My reply, "The Push and Pull of Conciliarist Thought and Religious Liberty: A Reply to Daniel Mark," can be found here. Marc DeGirolami Reviews "Conciliarism and American Founding"
Last week, legal scholar Marc DeGirolami (Professor of Law and Associate Director of the Center for Law and Religion at St. John's University School of Law) reviewed my William and Mary Quarterly article, "Conciliarism and the American Founding." Marc runs the Law and Religion Forum, one of the best online sources for law and religion news and commentary. He is the author of The Tragedy of Religion Freedom (Harvard, 2013) and is writing a chapter for the volume I'm co-editing, The Cambridge Companion to the First Amendment and Religious Liberty (Cambridge, forthcoming). "Connected to the conciliarism of American Catholics was their rejection of any political aspirations for the Church–a kind of non-interventionism which rendered them possible subjects for toleration in the new American dispensation. The civil state was the unquestioned sovereign for these Catholics, not the Church. "Breidenbach writes as a historian, of course, and does not openly praise or condemn these developments. The plant of Christianity (and Catholicism specifically) obviously did not encounter the same type of soil that it did in Japan. The soil changed the plant–made the plant accommodate itself to the soil’s demands, or else die. Indeed, it is often said that in America, all religions become Americanized, and the talk of conciliarism reminds me a bit of Professor Sally Gordon’s discussion of the flattening out (hierarchically speaking) of Christianity in America once it adopted the corporate form. Breidenbach’s article made me wonder, in the long run and as the American state continues to grow, which soil actually will prove the less hospitable. Read Breidenbach!" For those interested in Aristotelian metaphysics, hylomorphism, and substance causation (and who isn't? ), I highly recommend a new volume published by Routledge. Full disclosure: my wife, Janice Chik Breidenbach, wrote an excellent chapter entitled, "Action, Animacy, and Substance Causation." Other contributors include: John Haldane, Xavi Lanao, Nicholas Teh, Edward Feser, Robert Koons, Alexander Pruss, William Simpson, Tuomas Tahko, Christopher Austin, Anna Marmodoro, David Oderberg, William Jaworski, and Daniel De Haan. It's available to order here. From the editors: "The last two decades have seen two significant trends emerging within the philosophy of science: the rapid development and focus on the philosophy of the specialised sciences, and a resurgence of Aristotelian metaphysics, much of which is concerned with the possibility of emergence, as well as the ontological status and indispensability of dispositions and powers in science. Despite these recent trends, few Aristotelian metaphysicians have engaged directly with the philosophy of the specialised sciences. Additionally, the relationship between fundamental Aristotelian concepts―such as 'hylomorphism,' 'substance,' and 'faculties'―and contemporary science has yet to receive a critical and systematic treatment. Neo-Aristotelian Perspectives on Contemporary Science aims to fill this gap in the literature by bringing together essays on the relationship between Aristotelianism and science that cut across interdisciplinary boundaries. The chapters in this volume are divided into two main sections covering the philosophy of physics and the philosophy of the life sciences. Featuring original contributions from distinguished and early-career scholars, this book will be of interest to specialists in analytical metaphysics and the philosophy of science."